The purpose of this project is to introduce the smart home to the Sri Lankan market, although there is ABC and SLT are trying to introduce this technology the customers have not got the full benefit of what it is to have a smart home, ABC has 2000 plus and SLT 1000 plus customers who are currently using these options. What we intend to introduce is the future, which has so many benefits to the customers in running a smart home from controlling the door locks, security system, electronic appliances to lighting, home robots and baby monitoring system. This makes the lives of the users very easy for their day-to-day work. Commencing operations in 1993, M was one of the foremost mobile service providers in Sri Lanka, beginning operations using first generation cellular technology – Advanced Mobile Phone System (AMPS)/ Time division multiple access (TDMA). In October 2002, M became a fully owned subsidiary of Sri Lanka Telecom. In the following years M grew from strength to strength, launching its fully-fledged EDGE/GPRS enabled 2.5G GSM network, which is designed to operate on dual band in 2004. M again established its dominance of the mobile communication industry by being one of the first ten mobile service providers in the world to launch a 3.5G HSPA network in 2007. M was also the first service provider with a super 3.5G network in South Asia. Furthermore, M successfully demonstrated HSPA + MIMO technology with downlink speeds of up to 28.8 Mbps and carried out a successful trial of 4G/LTE technology with downlink speeds exceeding 96 Mbps, for the first time in the South Asian region. In addition, M recently launched Dual Carrier HSPA+ technology and it is now equipped with the country’s first mobile 4G/LTE equipment. Currently standing with a customer base of over 5 million M continued with its strategy positioned around value innovation and customer centricity, making the best out of the technology being used, distribution systems, product portfolio and value added services with heightened acumen focused on customer needs and interests. Recognized by the Institute of Engineers Sri Lanka (IESL) for the third consecutive year for engineering services, M was bestowed with the ‘Engineering Excellence Award 2014’ for the completion of Stage VII project. (The largest network expansion project, which consists of more than 1530 2G/3G/LTE nodes, 700 Transmission nodes and more than 430 infrastructural elements). Further, M was awarded with the prestigious ISO 27001:2005 certification for the company’s solid and reliable Information Security Management System (ISMS) for securing information within the organization and ensuring safety and reliability to customers. Licenses issued to products and services are limited. Political influence and direct government involvement in the operations of the company. Reduction on tax on Mobile devices. Bounded by the TRCSL regulations. The government acknowledging the use of internet as a basic human right by pushing for a Wi-Fi free country. The government increasing tariffs has led to the increase in customer mobile bills. Government in increasing the taxes on telecommunication operators in Sri Lanka. Interest and inflation rates fluctuation affects the telecommunication industry; it effects the expenses in expanding the coverage by building new tower sites. In addition, more and more infrastructure comes up in the country the requirement for the company to build tall towers as revenue depends on the amount of customers that require telecommunication in the area. The need for everything to be available and accessible 24 hours by 7 days is growing rapidly. Telecommunications has become a need in the daily life of the average person. Telecommunication companies are monopoles, they are in charge of the internet and mobile carriers, therefore the customers’ needs depend on these operators. The telecommunications services are advancing each year with new developments in Sri Lanka, Sri Lanka Telecom started offering fiber optic lines, which reaches a speed of 100 Mbps, and phones are becoming compact month-by-month offering new technologies to the customers. Since the basic need of communication is covered, now what people want is internet access on the go, so now advancements in data communications is given more preference. Climate changes and global warming can affect how telecommunication products reach customers. Products and services come and go, often replaced by something ‘better’ depending on who is asked, customer or company. The previous version becomes redundant or unnecessary. Customer demand is high on telecom companies, therefore the needs are changing often. The Telecommunication Regulatory Commission Sri Lanka (TRCSL) is the governing board, which stipulates the rules and regulations for the telecommunication operators in Sri Lanka. Particularly issues with the government, monopolies, and customers. The suppliers bargaining power has increased influence on the profitability of the company. Increase in the bargaining power of the supplier will lead to a decrease in profits or increase in the price of the product (Buyer). There is a price war happening between the different mobile operators, so even the suppliers are chosen carefully so that they do not drag down the profitability of the company .So the suppliers have less bargaining power in this industry. Mobile Tower Companies, the two main companies are Huawei and ZTE. Mobile phone handsets (Samsung, HTC, Nokia, etc.). Buyers in Telecom industry generally land in two categories: Individual and Enterprise Customers like IT companies, Banks etc. There are ample number of telecom providers in the market with big product variance and cheaper prices, which gives buyer many options to select operators and thus have a large bargaining advantage. There are five main players in the Market in Sri Lanka. Market growth in the 3G and 4G. High competition with ABC having 40% of the market share. Global presence of ABC, Et, Ai and H in the market. Telecom sector is one of the fastest growing sectors. This is due to strong competition that has brought down tariffs and simplification of policy environment by the TRCSL that has promoted healthy competition amongst various players. The government has eased the rules regarding inter circle and intra circle mergers. As the sector is moving closer to maturity, further consolidation is a reality and this will lead to the survival of more profitable players in this segment. Internet subscriber base increasing in Sri Lanka by 18.06%, compared to 10.60% for GSM/CDMA services. M is also contemplating allowing operators without a unified access license, which includes broadband and Internet companies such as Google, What’s App, Viber and Skype to offer telephony services for international calling and PC-to-PC domestic calls. Internet Telephony eating into the revenue of GSM/CDMA telephony. Flat/ fixed rate revenues from internet services – cannibalization of revenues from GSM/CDMA services. ABC having the largest customer base in the market and M having the second largest share, it is difficult for new players / investors to enter in to the market. The existing Telecom players might begin to bundle broadband, voice, wireless, video and other emerging technologies together, as well as a variety of value added content, in an effort to remain competitive, offer seamless services and attract more customers, at a cheaper price (incumbent wrath). The human resources team comprises of Recruitment, HR Operations, Payroll, Performance Management, Training and Development teams. The HR team jointly with the Management ensure the staff requirements and operational requirements are met so that day-to-day company operations are not disrupted. They look after the legal matters in the company for notarial execution and litigations, regulatory affairs and NII this is the M legal team. The head of the Corporate Affairs team overlooks the HR team. The administration team looks after all the M property and maintenance of the building along with the security. The Administration team also includes the procurement team which calls for quotations / tenders from other vendors for the company. The finance team keeps track of the budgets, expenditure and payments to all M vendors. The main source of revenue is generated through the sales team who are located island wide. This dedicated team of more than 400 staff does day-to-day sales for more than 5 million customers at M.
The marketing team handles all the band awareness campaigns and does the research on new projects. The enterprise business team is the team who represent the company for all the corporate and public sector clients. The corporate strategy tem plans the budgets for the company’s plans and investments / interests. The head of the corporate strategy team overlooks the Finance team. The engineering team is the heart of the company, which drives the entire set of mobile towers and keeps all the telecommunication lines live without any failure. This team works night and day to ensure that the company towers are working 24 24 by 7. They comprise of four teams, which are Site Acquisition, Engineering Operations, Network Planning and Projects. The information system team provides the backbone for the Engineering teams and the sales team. They also have an in house software development team that does all the software developments the company needs and this team develops most of the value added services requested by the enterprise business team. The enterprise risk team looks after all of the compliance concerns in the company by conducting spot and regular audits, the information security team looks after the IT security of the company so that the IT software and infrastructure is secure from all treats outside like hackers, Trojans, Viruses, etc. The customer care team monitors all of the front line sales counter quality by having spot checks on how the employee treat customers and train these employees on how to handle customers. The Contact Centre takes in all of the customer complaints and requirements, the contact center is handled by M and there is a outsource center which also handles customer calls. M uses promotional pricing strategy to attract more customers during April and December seasons. Penetrating pricing strategy is appropriate to Increase the multiple connection & obtaining potential consumers. Consumers can send the online application and attached the relevant supporting documents. The regional office staffs do a feasibility checking and inform to the customer. Customers can make the online payments. Interpersonal and communication skills of staff. Training and development programs are conducted to enhance the skills of staff. Rewards and Compensations based on staff performance, which is above market rates. Good relationship building and team work. In the telecommunication industry each couple of months new products / services are introduced, these products / services slowly grow into the market and certain years major breakthroughs in technology is introduced to the consumer. The growth of these products all depend on the service quality maintained by M to its consumer, service quality is the quality of network bandwidth maintained in each area. Within time, each product is given price changes as per market development or through changes pushed by the authorities. Product differentiation & Product improvements. With the maturity on products like voice and data packages, voice packages have reached the peak of its maturity and data is moving at the steady speed. Sales are highest, but the rate of growth is slowing down. High profits for those with high market share. The voice packages which has been a product being offered from the time of the inception of M is slowly declining as now people are mostly interested in data, within the data stream there are so many voice call options, like Skype, Whats App, Viber, etc. Star – generates large amount of cash because of their strong relative market share and consumes large amount of revenue because of the high growth rate. 4G is a technology, which is rapidly growing at M but being in a highly competitive market the company has to spend large amount of money in setting up 4G towers around the country and due to the competition in the market, the company can only sell 4G related hard ware like 4G dongles with a minimum profit margin. mCash is a lifestyle service which the company started in rival to ABC Easy Pay, this service allows customers transfer cash into their M accounts and do transactions from any location in Sri Lanka. But the drawback of this service is the banks are also providing similar services and to compete with ABC and all the banks in Sri Lanka is draining a lot of revenue from the company. Since mCash is involved in large amounts of money transactions, and involves a good IT infrastructure with stare of the art security, which is audited time to time by the internal audit team and the Central Bank of Sri Lanka. Cash Cow – leaders in the mature market, this is the Upahara package, which M launched in the year 2009, which has brought the company way forward in the competition with government sector employees started changing from their existing packaged to the Upahara package. VAS or value added services is still growing in the market therefore it has only a low market share and low growth rate compared to voice and data connections. VAS also involves a lot of research and development which the company spends a lot of money, therefore it is not the best source of income for M at this moment. The customer analysis show that the currently the target set of customers is everyone, being a telecommunications company, M has to cover all segmentations to ensure it has a lead over the other telecommunications operators. Geographic, M has its coverage island wide, which covers all the districts and the most rural areas. Demographic, there is no gender or age barrier except for children/infants age 5 and below don’t use mobile phones nor do they use parent GPS tracking or emergency call service. Therefore, everyone without any restriction uses phones. Psychographic, for M all lifestyles, religions, attitudes and values of people is important, example Sinhala and Tamil New Year, Christmas are two season where there is a peak in the mobile phone and data usage. Behavioral, M values the customer’s degree of loyalty towards the brand and reward the customer by giving free giveaways and other benefit options. The company manages the process of receiving, storing raw materials (i.e. supplies), and distributing finished goods to customers. These information exchanges typically involve a large number of enterprise databases that belong to multiple business partners, and consequently visibility of materials and resources facilitates operational readiness in receiving and delivery timeliness. The logistics are handled by the Inventory team, uses a software system to track each items move. M moved in to an Enterprise Resource Planning system during the last quarter of 2016, this system increased the tracking and efficiency of stock counts than the previous system, at any given time a snapshot is available to the user and the system has the ability to preorder stock, which is on demand. In addition, two-way connectivity between mobile workers (e.g. drivers) and dispatch allows for real-time driving directions, route changes, and delivery schedule updates. In addition to the above benefits, fleet management is also optimized with integrated wireless solutions. By monitoring a vehicle’s status wirelessly, the company is able to improve their situational awareness, security and decision making in tracking and managing shipments as they move through supply chains. Operations reflect value-creating activities that transform inputs into final products or services. The products are developed through the PDCS (Product Development and Customer Service) team who are a part of the IT team and there are corporate developments and government tenders, which are taken up by the Enterprise Business team. M depends on promotion and distribution, promotion takes place in the form of advertising, campaigning, billboards, sponsorships and free giveaways. The distribution takes place through the branches located island wide and the third party outlets like the dealers who are registered with M, these dealers bring in most of the revenue to the company. The dealer is given sales targets which they need to achieve; they have to bring in 50% of the profit through their chain of contacts. These dealers are a valuable source of income for M; furthermore, the company has expanded in distribution through Singer Mega outlets, SLT Teleshops and through important government locations like the Bandaranayke International Airport, The Economic Center, Immigration Centre, etc. M keeps improving the availability of information; workers are more knowledgeable and consequently more productive and effective in satisfying customer needs. The company is expanding by driving awareness campaigns through advertisements, billboards and through social media. Corporate responsibility does not end with the sale of a product or service. It continues with ongoing support through after-sales activities that aim to maintain or enhance product value. There are many services that are in operation at M, once a SIM is sold from its registration to activation many backend automations take place, these automations are made possible by the IT, Engineering and Sales teams. All these teams need to work together in sync to ensure the required service levels to the customers are maintained. This support activity encompasses all purchasing transactions for goods and services. Optimal conditions include the lowest price and highest quality for what is being purchased. Transactional cost savings, increased flexibility, and customer satisfaction are a few of the expected benefits realized when enabling an organization with a good procurement team. The procurement team comprising of 5 members do so much in a little timeframe for the company, they look into tenders, orders of supplies, negotiating with vendors, calling for quotations, doing market analysis on products prior to purchasing, etc. The procurement team mainly supports the Engineering, IT, Administration, Marketing and Sales teams. HR team of the organization is responsible for employee recruitment, selection, training, development, motivation, and rewards. As employees are an expensive and vital resource to an organization, effective and efficient human resource management (HRM) can add significant value to a firm. The HR team along with Hay Group introduced a new performance management system into the company in the year 2015, in this process all Management level job descriptions were rewritten and the Management structure was realigned. This had been a great achievement for the HR team furthermore, the HR team had been able to bridge the gap on staff whose salaries where not in line with the market rate payments. The HR team support the operational teams by ensuring the recruitments are available on time. The HR team also overlooks the outsource employee requirements of the company which mainly supports the Contact Centre, Engineering and Sales teams. Activities focusing on technology development add value to an organization by introducing innovative technology that improves services, products, and business processes. Hence, technology development is an important catalyst for competitive advantage. Monthly there are many technological advances that take place in the telecommunications industry and how the company adapts to those changes is what gives M its competitive advantage over the other service providers. The Engineering team is always sent for technology related conferences so that they can learn new concepts and bring back new ideas on how to improve the company’s network bandwidth to the customer. A competitive business environment calls for a firm’s ongoing effort to develop competitive advantage. This may be found in any of the following gains: operational efficiency (e.g. reducing costs, improving communication); innovation (e.g. implementing new business processes); revenue generation (e.g. increased productivity, introduction of new revenue streams); and customer satisfaction (e.g. improved service). Mobility support is a factor that can positively influence any of the above areas. While employee reachability via mobile phones may be a good start, a truly mobile-enabled enterprise emerges only when employees, applications, and infrastructure are fully integrated. A firm’s infrastructure supports the entire organization and its value chain through systems and mechanisms for planning and control, such as accounting, legal, and financial services. All office infrastructure is managed by the Administration team, who manage more than 150 locations and the Site Acquisition team which is under the Engineering team manages all the tower sites located in Sri Lanka. The stakeholder are the customers of M, stakeholder analysis identifies all primary and secondary stakeholders who have a stake in the issues with which M is concerned. The goal of stakeholder analysis is to develop a strategic view of the human and institutional landscape, and the relationships between the different stakeholders and the issues they care about most. The staff at M are selected through a rigorous shortlisting process from the time when an applicant sends an application. M is streamlining its processors with the recent implementation of an ERP (Enterprise Resource Planning) system and with the future implementation of the CRM (Customer Relationship Management) system most of the internal processors will be streamlined in the company. Technology is ever changing in today’s society and there are rapid adaption which companies are adopting with these changes, ABC, Ai, E are international companies with the exposure to these technologies than M, due to this concern M spends a lot on staff trainings by sending staff to China where they go to the ZTE and Huawei training centers to learn new technologies and other world mobile conferences so that M as a local company can compete with the rival companies. Strong brand name and infrastructure. Range of Value Added Services. Total of 108 million assets. First to introduce 4G technology to Sri Lanka. Level of motivation to the internal employees decreasing. Weak packages for corporate sectors compared to the competitors. Technological advancement with 5G mobile communication. Can go for business diversification Highly competitive environment. ABC still having the largest customer base in Sri Lanka. High inflation rate in Sri Lanka. Rapid changes in laws and regulations. Every employee has a role to play in our vision to lead, helping us to focus our efforts and remain a truly dynamic and successful organization (M (Private) Limited, 2015). These are the three key ingredients in our relationship with our Shareholders, Employees, and Customers. Committing to these three principles as an individual and as a team and by regularly practicing them as an organization, we can truly achieve our vision to lead (M (Private) Limited, 2015). Integrity – Doing the right thing, always. Innovation – Doing business differently. Dynamism – Getting things done. Accountability – Taking responsibility for our actions. Passion – The difference between excellence & mediocrity. Professionalism – Maintaining high standards (M (Private) Limited, 2015). What we are trying to do is improve the service quality of the company by offering all the products at the same price range. When the service quality increases, more consumers will switch to M from other subscribers. This is the money available in M in the form of cash, credit and liquid securities. Before launching the business, M should have sufficient funds to go ahead with the new expansion. The Corporate Planning team needs to allocate the respective funds for the project. The staff for this project need to have the technical skills, which are required for customer demonstrations, site visits and customer location set-ups. A highly energetic and enthusiastic workforce is required to offer the best possible service to the customer. A location would be required to setup with the digital home appliances so that customers can see the benefits of these products. Therefore, the need to have a proper building with adequate space would be required in order to run its operations smoothly. Since, the location will be based in the heart of Colombo; a high rent would have to be paid. The setup should look like a home with a living room, kitchen, bedroom, TV room and washrooms. Basic requirements would be an internet connection, which is available 24 hours a day and all the home electric appliances. Digital home appliances should also be available, this includes CCTV, Wi-Fi enables switching system, and bulbs, etc. these will be the tools used to demonstrate to the customers on how the digital home works. The core competencies are M having a strong financial backbone to fund this future investments, M has made a revenue of Rs. 32.56 billion in the year 2015 and has made a profit after tax of Rs. 2713 million (M (Private) Limited, 2015). M has a good brand awareness within the population of Sri Lanka being the second largest telecommunication provider in Sri Lanka and having a customer base of 5.9 million subscribers (M (Private) Limited, 2015). Parent company is Sri Lanka Telecom, which is the first telecommunications provider in Sri Lanka, has the backing of the government and is the market leader in providing landline connections to all subscribers in Sri Lanka. Increasing profitability by introducing the digital home to increase the company profit margin. Improve the market share by growing the business by increasing revenue and more customers by building on more subscribers. Superior brand recognition by introducing good products to the market that a consumer will want to buy. Increase return on investment by turning profits into money or capital .A higher rate ROI ensures that company will receive funds more quickly for investments in other ventures, or that funds can be further reinvested in the business. Creating process improvements to have significant internal business objectives to achieve to create superior customer values and eliminate non value-added activities from the processes by setting process improvement goals. Improving and maintaining goodwill to maintain a good image in the market. Most of the employees do not have proper KPI, which is been defined at the start of the year, these employees work as per the task given and at the end of the year is rated by the Supervisor on the given tasks. Since the rating does not happen in fair and just manner, most employees are disappointed in the performance management system. Although the Management had tried to bring in a professional group like Hay to revive the company’s business objectives and align the company score cards of employees (KPI’s) with the failure on the Top Managements support in completing the process and in keeping the process going each year no target or KPI was defined for the employee to be rated at the end of the year based on his / her performance. To improve the motivation the performance management methods would not be enough and the organizational management should follow various methods to improve the employee satisfaction. The organizational environment should have both intrinsic and extrinsic factors which would encourage the proper employee satisfaction in the organisation. Mainly the organisation should have the proper working environment which would satisfy the employees. To improve the employee satisfaction it is required to identify the existing drawbacks of the environment. For the identification first the environment should be analysed and propose solutions. M has a wide network operating in Sri Lanka, but most consumers have a problem with the bandwidth as calls at time drop while the customer is on the call. This has created a bad image within the consumers and due to high demand of supply in the area; calls are difficult to be made by the customer. The quality drops would not improve the brand image in the market. Because the consumer would compare the services with the existing market competitors. This would open the potential of losing the consumer to the competitive brands. The organisation should understand when the technology is developing it is essential to align with the new consumer demands. The number of consumers are increasing which means the organisational revenue generation is increasing. Therefore the organisation should allocate more funds for the infrastructure development which would promise the high quality services to the consumers. M has a week online advertising as the company mostly spends on sponsorships, billboards, TV and radio commercials. There are so many options for marketing online through Facebook, LinkedIn, Instagram, Snapchat, Viber, What’s App, etc. but most of these applications are not been used although there are many users of these applications in Sri Lanka specially in the youth sector. There are specialized consultant companies and designated people who professionally offer services for online advertising, M should invest in such a person or advertising firm. It is essential to analyse the current methodologies of the marketing. The organisation should avoid the traditional methods if the modern methods are much promising to the organisation. When advertising it is essential to identify the communication methods to the target consumers. The selected method should allow the organisation to reach to the consumer directly to improve the awareness about the service portfolio. M has many of its staff who has been in the company for many years, these staff and the Top Management have some who have completed 20 years of service and have a retirement age of 60 years. The company has the political backing and as the parent company Sri Lanka Telecom, due to these factors and the company having a strength of 5.9 million consumers the Management knows that the company will function and continue to function without any issue and many staff is available to share the designated work. With no performance-based culture, the employees tend to take a layed back approach in their day-to-day tasks and duties. The layback company culture would not be beneficial to the organisation. This would discourage the employees to be creative in the organisation and they would enjoy the previous achievements of the organisation without doing anything for the future. The management should improve the organisational collaboration through positive people management methods. Better benefits and treatments should be given to the employees to improve their attitudes and work for the development of the organisation. the biggest competitor has won the trust of most corporate sector clients by offering subsidized and overall benefit packages. Corporate sector is much beneficial to the organisation because it would open much potential revenue generation to the organisation. By serving the corporate sector the organisation would be able to improve the relationship among the business entities. Because of this the management should actively improve the organisational selling to the corporate sector by making tailor made options for their corporate needs. First the organisational management should assess the current corporate needs of the environment and what are the existing packages that are offered by the competitors. To gain the competitive advantage the organisation should give the consumer something different and to do that the organisation should have high level of awareness of market demand. By assessing the market needs the organisation would be able to provide much compatible corporate packages to the market which would improve the corporate trust towards the brand. 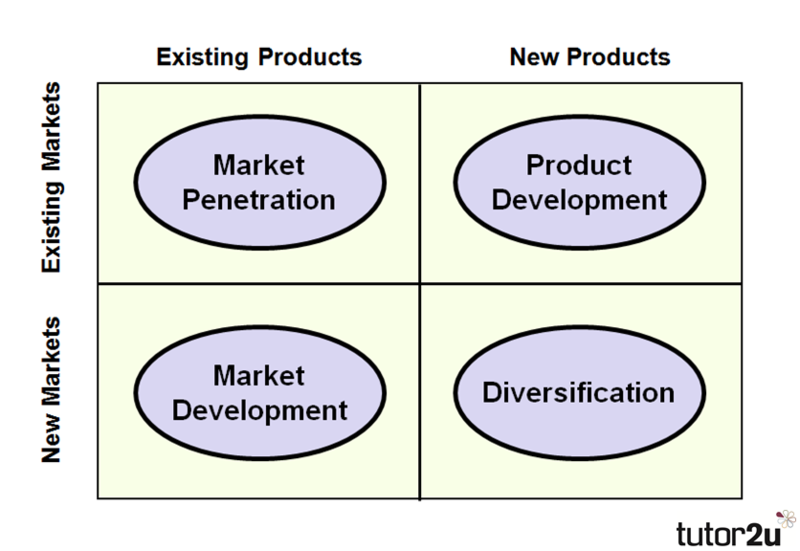 Ansoff Matrix can be used for the purpose of developing strategy for the external growth..
Market penetration can be used for the organisation when they want to improve the current market of the organisation with the current products. 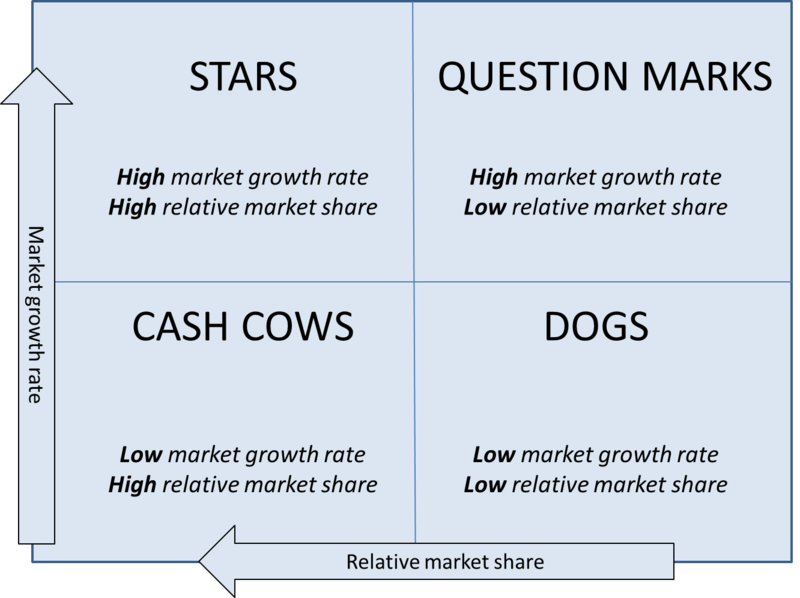 Many organisations are following the Market penetration methods to improve the organisational market share by conducting various functions. Since the market penetration is encouraging the organisation to do many market related and the product related functions the management should have higher level of marketing capabilities to get the maximum benefits out of the market penetration. Market penetration is encouraging to function in the existing market for the growth and because of that, this method can be named as much safer to the organisational marketing management functions. The consumers of the market are already aware of the product and organisation, therefore the organisation would not require to conduct heavy marketing management functions for the development. When providing the existing products for the new market, the organisation has to focus on the development of the market. The new market might not be touched by the organisation and therefore they have to learn about this new market more. Also if the competitors are functioning in that market with similar products, that can be used as the reference observation to the organisation. Sometimes the organisation is introducing a new product that is new to the new market. In that case the organisation would require to study the market thoroughly. The product diversification strategy should be used in such scenario. The diversification would encourage the development of product categories according to the consumer demand. Because of this consumer demands and requirements should be identified to conduct better diversification strategy. When the organisation is providing the new products to the existing market, the organisation is required to conduct product development strategies. The organisation is aware of the existing market behaviours and therefore the organisation would require to develop the product to meet the market requirements. Sustainable position in the market can be named as a dream of any organisation. The organisational sustainability can be achieved by maintaining a good relationship with the consumers and the stakeholders of the organisation. Proper communicational methods can be introduced in the organisation to improve the relationship among the stakeholders and the organisation. The information sharing should be improved to achieve that success and first the organisation should identify who are the stakeholders of the organisation through the stakeholder mapping. The stakeholders should be given the positions according to their value to the organisation, the organisation should give the proper level of attention and communication as per that value. This would eventually fill the gap between the organisation and the stakeholders. Stakeholder analysis should be conducted by the organisation regularly because sometimes the value of the stakeholder would differ to certain situations. By identifying the correct value and the correct requirements of the stakeholder the organisation would be able to provide the satisfaction to them. The stakeholder satisfaction would ensure the stable market position to the organisation. Also the organisation should identify the critical success factors which would ensure the organisational stability. The organisational development and the sustainability would rely on the information gathering. When the information gathering is improving the organisation would have many options to be considered in the market and also the organisation is aware of the current status of the organisation. The organisational research and development functions would ensure the information gathering to the organisation. The market research and organisational research would define the current market and organisational status and what are the development opportunities. Various development potentials can be identified through that and the organisation has to be much innovative when fulfilling such demands for the development. The new idea generation should be improved and encouraged by the management for better development of the organisation. M can be named as a giant in the market with the positive level of support from the various important stakeholders. The organisation has the position where the competitors cannot be replicated within themselves. High level of government back and support can be named as such opportunity to the organisation. Because of this the organisation would not face the risk of failure as the other competitive organisation. M can be named as an organisation which are not using its own strengths for the maximum level of capabilities. The organisation should follow good innovation and entrepreneurship practices in the organisation to overcome the market challenges. M is in a position that can take various risks and also the organisation has the capability of avoiding the risks of failure due to the positive support of the government. Also the consumers of the market are trusting the brand and the Sri Lankans are proud to say that M is a Sri Lankan communication service. Because of this nationality feeling the consumers are favouring the brand. Due to all these reasons the organisation can handle the entrepreneurship in the market well. First organisation should identify all the potential risks which would associate with the new functions and propose solutions to minimise the risks. The risk assessment can be done using a matrix which would categorised the risks according to the occurrence and impact. The high impact and high occurrence risks should be assess thoroughly and the organisational creative thinking should ensure the avoidance or minimisation of such risks. The new idea generation should be improved in the organisation to get the higher level of consumer intimacy to the organisation. Through the new idea generation of the organisation, the organisation would be able to introduce new product development to the organisational portfolio. When doing that the organisational management should have to consider the risk of failure in such event. It is essential consider the potentials of the failures and propose various alternative solutions to overcome those failures. In the business environment it is essential to take little risk to make benefits to the organisation. But risk taking should not give devastating results to the organisation. The failures should be bearable to the organisation and the management should highly consider this when conducting the entrepreneurship in the organisation. The above discussed methodologies would define the external market growth opportunities and it is essential to identify the organisational requirement level of growth and what would the best opportunity to the growth according to the organisational requirements. The organisation is currently facing the high level of market competition with the competitive brands of market. The organisation wants to grow its existing market share by improving the organisational process into much positive status. During the SWOT analysis of the organisation it was identified that the organisation is following much traditional methodologies when it comes to the organisational management and consumer handling functions in the organisation. Since the organisation has the strong backup support of the government and the organisation has achieved some level of market share which continuously generate the revenue to the organisation, the employees and the management of M do not worry about the organisational growth. The other competitive brands are using this opportunity to grow in the market and slowly those competitive brands are capturing the market by providing the services which M is failed to implement in the market. Mainly ABC is differentiating its product portfolio and give the service to the consumer by always assessing their communication requirements. Also ABC is providing high amount of value added services to the consumers and high level of consumer services to assist the consumers when there is a problem. This has improved the consumer positive perception in the market and slowly the consumers are selecting ABC because of the high quality services and the improved value added services. The organisation has the opportunity of addressing the rapid growth of mobile communication usage. The brand is a Sri Lankan brand and therefore still M has high level of consumer loyalty. This can be used in the mobile communication usage growth demands in the market. Also as it was discussed in the earlier topic the organisation does not provide much solutions to the corporate sector and because of this the organisation has high level of potential to diversification. Through diversified service portfolio the organisation would be able to build strong corporate network relationships around the organisation. Also the corporate reputation of the organisation would grow higher due to that. The organisation is functioning in the rapidly changing technological environment and because of that the organisation should ready for the new technological advancements of the industry. In the near future the 5G mobile technology would be established and the organisation should get ready for that from today onwards. All the organisational functions and the marketing methodologies should be assessed to identify the further development potentials. The organisation should get ready with step by step approach to the face the near future technological changes in the industry. Mainly the organisation require to grow its market share in the market and to do that the organisation should improve the market penetration in the organisation. Market penetration is targeting to grow the existing market with the existing products. This strategy is low risky to the organisation, but this would make major changes to the organisation as well. The reason for the low risk is level is because the organisation is selling the existing product to the existing market to improve the selling of the market and to improve the market share owned by the organisation. As it was discussed in the earlier the organisation is having some weaknesses which are relevant to the organisational processes and to the consumer care. By following the market penetration functions the organisation would encourage to look at the existing demands of the market and address those demands effectively and efficiently through the existing products of the market. This is very low risk and the organisation can start the market share improving process through the improvement of the consumer care. It was discussed there was inefficiency in the consumer care and the organisation can improve its service level through providing a good level of consumer care to the consumers. To identify the consumer expectations the organisation should conduct proper consumer survey which would allow the organisation to collect the consumer feedbacks about the organisation. Main expectation of the survey is to identify the weaknesses of the consumer care of the organisation and address those weaknesses with the creative solution providing. Afterwards the organisation can conduct below main functions to improve the market penetration activities of the organisation. The organisation should increase the existing market share of the current product portfolio and to do that the organisation can implement high level of advertising and sales promotion functions. Sales and promotion would not only be enough and the organisation should implement much effective pricing methodologies to the service portfolio. The consumer would purchase the products when the price is right and with the proper level of advertising and promotions the organisation would be able to attract more consumers to the organisation. Also the organisation should secure dominance of the growing next generation market. In the mobile communication service industry, this growing next generation market is the younger population of the country. The youngsters would question what connection they should buy and when it comes to the purchase decision making, they should consider M with higher level of justification. This can be named as making the dominance of the growing market share. To achieve that objective the organisation can improve the consumer awareness about the service portfolio through advertising. The consumers should know about the service packages of M. Since the younger generation are much oriented to the social media web site usage, M can use that communication channel to approach to the youngsters. The development of the current service portfolio should be done due to demands of the market. When organisation is start achieving the growing market share of the market, eventually the organisation would be able to improve the existing market share for the existing products of the organisation. The organisation is expecting introduce the full benefits of the smart home facilities to the Sri Lankans. Currently this service is offered by ABC and M, but to a smaller consumer portion. This indicated that the both organisations have not yet achieve the full market share potential. M should start the lead in the market because of the high level of market share potential. The organisation can get the feedbacks from the current consumers of the service and make necessary improvements for the development of the services. Then the organisation can improve its services and the market share with the proper level of promotions and capture the growing market share to the product. 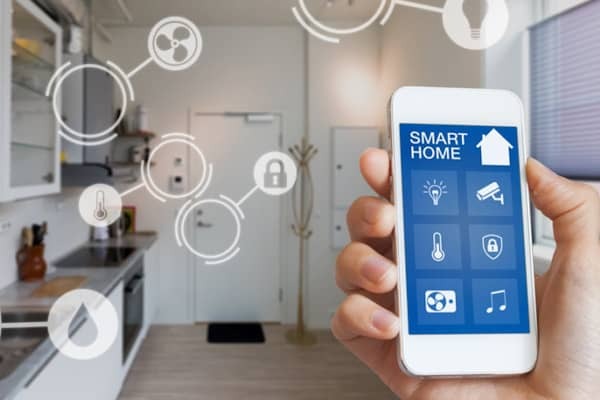 Smart home facility would have a good market potential growth and that should be considered by the organisation as a factor when addressing the business risk of the market share improvement. The strategic business unit plan would effect to the next two years of time for the exiting market share improvement to the organisation. Currently the organisation is having comparatively lower market share and the organisation is expecting to improve that market share by competing in the market while making various competitive advantages to the organisation. Below it was stated the objectives of the business units plans. Improve the marketing functions of the organisation by making various new communicational channels with the consumer such as social media, mobile advertising and we advertising. Enhance the consumer awareness by improving the marketing functions and also improve the promotions of the Smart Home concept to the consumer. Achieve high level of employee satisfaction in the organisation and grow the employee engagement to the organisational functions. The employees should actively participate for the development of the organisational functions and they should provide innovative ideas for the ongoing challenges that may occur during the business process. Enhance the research and development functions of the organisation. The R&D should be able to capture the new market and business potential by assessing the external environmental conditions to the organisation. Improve the organisational productivity through business process assessment. The business process analysis and assessment would ensure the avoidance of unwanted business process steps and also it would improve the business process productivity by suggesting various improvement potentials. Achieve higher level of corporate relationship with the suppliers by getting their high quality input to the organisation with proper caring to them. The organisation should ensure that supplier satisfaction by ensuring to meet their expectations. This would improve the supplier loyalty to the organisation. Reduce the consumer complaints towards the service by improving the consumer care and technical support to the consumers. Improve the telecommunication infrastructural development of the organisation to meet the future development potentials of the industry. Marketing Market penetration strategies would be implemented to improve the market share to the organisation. The high amount of loyal consumer base can be seen in competitors and if the organisation is failed to select proper marketing channels and the functions the marketing investment would not give the expected return for the investment. Finance Achieve high level of revenue generation through the market expansion The market expansion would happen if the marketing functions were carried out properly. This indicates the dependence of the marketing functions and sometimes marketing functions would require higher amount of investment but generate lesser revenue generation ratio when comparing to the investment. Operations Improve the productivity, efficiency and effectiveness through process analysis and development When analysing the organisational processes, the management would be able to identify various improvements but this would change the processes. Massive changes of the process would not be welcomed by the employees and the management would require to spend excessive amount of time to do change management functions. R&D Generate demand for the new idea generation while funding more to the R&D division of the organisation The new idea generation would be better to the organisation, but new idea implementation would have the high level of risk of failure. Even the market and environmental analysis were correctly conducted, various unexpected reasons would impact the new idea execution. Purchase and supply chain Improve the supplier intimacy The supplier intimacy would benefit the organisation, but when creating the supplier intimacy the organisation would require to consider supplier satisfaction. Because of that the negotiation processes of the suppliers would be challenging. Sales and customer service Achieve word of mouth recommendations by providing the new and enhance consumer care services There would be high amount of existing loyal consumers to other competitive brands and they would not be able to identify the difference of the enhanced consumer care of M, because they are already experiencing such consumer care with the current service provider. Assess the current demand of the consumer. Conduct marketing and sales campaigns to improve the consumer awareness. Assess the ROI with the improved revenue generation through the marketing functions. Assess the current organisational environment to identify the employee dissatisfaction factors. Justification of the factors and avoidance of justified dissatisfaction factors. Assess the intrinsic and extrinsic factors through observation and referring the past knowledge. Implementation of new methodologies which would improve the intrinsic and the extrinsic factors of the motivation. Assess current level of financial status. Identify the financial flows of the organisation and cut the unnecessary cost of the operations. Supply proper cash flow to the marketing functions with proper level of ROI assessments. Assess the existing business processes. Identify the unwanted process steps and understand the significance of removing such steps. Establish new idea capturing methods in the organisation. Encourage employees to provide new ideas which would improve the innovation of the organisation. Improve the communication channels with the supplier. Identify the supplier expectations and justify the expectations. Improve the intimacy through satisfying the expectations of the supplier. Assess the consumer expectations through consumer survey. Implement more staff to capture the consumer feedbacks. Encourage the employees to provide much positive consumer care to the consumers. Assess the negative feedbacks of the consumers and implement a method which would ensure the avoidance of duplication of same negative feedback of the consumer. The each strategic business unit is important to the organisation and therefore the necessary resource allocation should be done to each unit of the organisation. When allocating the resources first it is essential to identify the level of resource requirement and its significance. During the study it was identified there are major drawbacks in the human capital and the marketing functions of the organisation. This should be considered more and should resolved immediately. Otherwise the organisation would not be able to achieve the expectations of the other SBU’s. The reason for that is that those SBU’s are also having the same employees who are not satisfied and lowered positive attitude for the organisational development. So first their mind sets should be improved and then the organisational revenue generation should be considered. The revenue generation would be improved in the organisation when the consumer base is improving. Secondly the resource allocation and development should be done in this area. Proper promotional activities and advertising would improve the consumer awareness and they would start purchasing the products of the organisation. The consumer care should be improved by improving the employees who are providing the consumer care and the necessary resources should be provided to the employees to provide such services to the consumers.